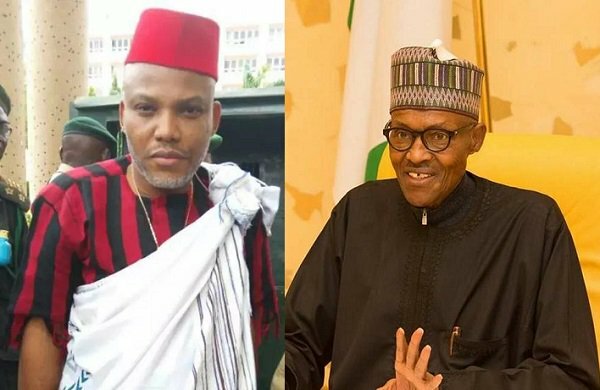 The leader of the Indigenous People of Biafra, IPOB, Nnamdi Kanu, has alleged that President Muhammadu Buhari is not a Nigerian but from Sudan. He alleged that the Nigerian government hired a look-alike to stand in for the President. Addressing his followers at his Umuahia residence, Kanu claimed that the current person ruling Nigeria was made to undergo “plastic surgery” and taught the mannerism of Buhari. The IPOB leader also disclosed that he would be appearing in court for his upcoming hearing. “The man you are looking at on the television is not Buhari, he is from Sudan. After extensive plastic surgery they brought him back. “The person was taught Buhari’s mannerisms and he came back deceiving all of you. I can stand and prove who I am but Buhari cannot do the same thing. He cannot deceive Nnamdi Kanu and IPOB. “The worst mistake Buhari ever made was to arrest me. I will break the zoo into pieces. I am taking IPOB to Abuja on the 17th of next month for my court case.